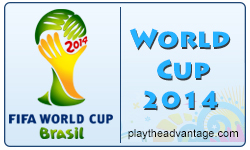 World Cup 2014: Meet the Refs! FIFA has put up short YouTube videos of each of the center referees who will participate in the World Cup in Brazil beginning this Thursday. They’re pretty fascinating and a great way to get to know these men who will have such an impact on the tournament. Could they have chosen cheesier music to introduce each of these guys? Apparently, the music is supposed to represent each referee’s “culture”, and is apparently chosen by the same guy who took those horrible pictures. The belly dancing music for the Iranian referee was a particularly nice touch. Nicola Rizzoli gets something you’d hear in a bad Italian restaurant and Yuishi Nichimura gets … geisha music? I…I don’t even know. And what the hell are those little bells going off for Svein Oddvar Moen? It’s like a bunch of Norwegian fairies that are all high on acid. No. Just, no. Howard Webb did tell the story of the other English refs calling him Shrek (complete with a glimpse of his phone’s Shrek home screen) and said that he didn’t want to be a referee when he was 18 because all referees were “old bald guys.” (See what he did there?) Adorable. Felix Brych is so dreamy it almost hurts to look at him. He’s definitely got the Hottest Ref title in the bag. Plus, hopefully the ESPN commentators can review his video so they don’t have to take their usual 50 stabs at the pronunciation of Brych. Last but not least, Jonas Eriksson needs to sit up straight. I would just say, that despite how “dreamy” Brych may be. He really needs to learn some social skills! I mean a little bit of enthusiasm would kill you Felix! For the opposite reason, Peter O’leary has got to get 1st place for his originality. Eriksson, Williams and Webb were all pretty good as well. Oh, come on…he’s German. He’s supposed to be cooler than us. Besides, I’d be grumpy too if I got that crappy intro music. Fair enough, the video does add to Brych’s “mystery”. And all the patriotic theme music was starting to get me really annoyed by the end as well. Thought Carlos Vera’s clown music was a bit harsh!